Compliance regulations such as SWIFT and GDPR can be challenging to understand and implement. 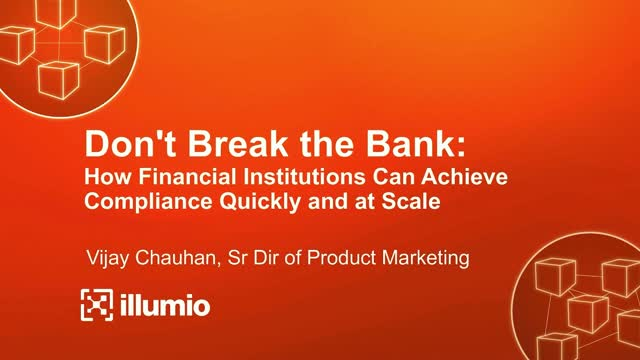 In this webinar, Vijay Chauhan shares his experiences as a security practitioner in financial services and highlights how Illumio helps the world’s largest financial institutions solve regulatory and compliance challenges quickly and at scale. According to the 2018 Verizon Data Breach & Incident Report there were 2236 confirmed breaches in 2017. In many instances, these organizations passed their PCI audits prior to the discovery of the breach. This trend is due to common errors and a “check-box” compliance mentality that relies on outdated approaches. This webinar will discuss how you can use threat models in combination with micro-segmentation to enhance the efficacy of your PCI DSS program. As Illumio’s Senior Product Marketing Manager, Vivian Tero focuses on risk and compliance solutions, as well as CTO and Product AR. Prior to Illumio, she was the Senior Product Manager for the GRC and Vendor Risk Management Suite with ServiceNow’s Security BU, and held product marketing and product management roles with Symantec’s Data Center Security BU. Vivian has an MBA from University of San Francisco and a degree in Mathematics from the University of San Carlos. Reducing your data center and cloud attack surface decreases your exposure, limits an attacker's mobility, and minimizes the impact of a breach. Vijay Chauhan is Sr. Director of Product Marketing at Illumio, where he leads Product Launches and Content. Prior to Illumio, he spent 4+ years at Splunk running Product Management and Strategic Alliances for Splunk’s Security business. He started his career as a Security Practitioner in Financial Services, spending 7+ years at Barclays Bank handling core information security functions. He has an MS in Computer Science from Stanford. Reducing your data centre and cloud attack surface decreases your exposure, limits an attacker's mobility, and minimises the impact of a breach. Companies of all sizes are struggling to ensure their applications are truly secure using aging firewall security systems. Micro-segmentation, when implemented correctly, offers the security you need and provides tremendous application visibility. To learn what it is and how to implement it, join us for this informative event. With the rise of hybrid multi-cloud architectures, micro-segmentation is fast becoming a foundational layer of the security architecture to help protect against unauthorized lateral movement and access to high-value assets. When implemented correctly, micro-segmentation can offer  the security needed and provide  tremendous application visibility in the process. Faraz Aladin, Head of Technical Product Marketing - Faraz Aladin is a Technical Product Marketing leader responsible for Product Marketing missions as well as technical evangelism. Having worked with customers across various segments and industry verticals, he is well versed in how customers successfully leverage technology to drive business outcomes. His subject matter expertise spans Networking & Cloud Infrastructure, Data Center Architectures, Security and Collaboration technologies. With over 25 years of industry experience, Faraz spent a major portion of his professional career at Cisco across various business units and roles before joining vArmour as Product Management and Marketing leader. He is a CCIE and holds an engineering degree from Bombay University. Compliance regulations such as SWIFT and GDPR can be challenging to understand and implement. Many of these regulations have cybersecurity requirements that are focused on protecting critical banking infrastructure with aggressive timelines – and without disrupting the very business-critical systems you’re trying to protect. Jumping from one set of requirements to another and to subsequent internal and external audits can feel like a never-ending cycle. - Approaches to protecting your "digital crown jewels"
Illumio Head of Cybersecurity Strategy, Nathaniel Gleicher, discusses steps healthcare organizations can take to defend against cybersecurity challenges and achieve HITRUST compliance. Illumio, the leader in micro-segmentation, prevents the spread of cyber threats inside data centers and cloud environments. Enterprises such as Morgan Stanley, BNP Paribas, Salesforce, and Oracle NetSuite use Illumio to reduce cyber risk and achieve regulatory compliance. Illumio’s Adaptive Security Platform™ uniquely protects critical information with real-time application dependency mapping and micro-segmentation that works in any data center, public cloud, or across hybrid deployments on bare-metal, virtualization and containers. For more information, visit www.illumio.com/what-we-do or follow us @Illumio.